I’ve heard a lot of mis-information bandied about lately regarding book publishing, specifically geared toward bloggers. And it’s DRIVING ME CRAZY. I live this industry every day, and have for the last 8 years, and I often find that my knowledge of the industry versus what is being spread around is vastly different. Myth. Sorta. Publishing is undergoing a massive change in the business model, very similar to what happened to the music industry when the digital revolution changed that industry. What is happening is that book publishing is facing that same digitization–and all the resultant challenges to the business model. BUT this doesn’t mean that publishing is actually dying. Truth: There is a lot that’s up in the air for the industry, but I don’t think there are many people who would claim that books (as in the content) are going anywhere. And for the foreseeable future, as long as there are books being written, there will be publishers to get books to consumers. Publishers are scrambling for writers–in particular bloggers with their built in audiences–because of the problems in the industry. Myth. Do you know how many books are published every year in the U.S.? For 2008 & 2009, it was right around 290,000 (update: for 2010, the numbers were around 315,000). You did not read that number wrong, it was actually 290,000. That is how many books are “traditionally published.” This doesn’t include the 1,000,000+ titles that are self-published, print on demand, or reprints of public domain works. This also doesn’t include ebooks. A lack of writers isn’t any more of an issue than it has ever been, and if anything, more books are published than ever before. Truth: Publishers are always looking for writers to publish, whatever field they may come from be it blogging or somewhere else…given that that writer has a book in them that a publisher thinks they can sell in one way, shape or form (preferably more than one). Having a big audience on your blog/Twitter/Facebook will bring publishers to you. Myth: Unless we’re talking HUGE numbers, the odds of this happening are really, really small. REALLY small. And even if you have huge numbers, it most likely won’t bring publishers to your door. Truth:Having a big audience can help make your book proposal more attractive to agents and publishers as ONE part of the package. If you write fiction, this is an easier selling point. If you write non-fiction, it gets a little more complicated as numbers aren’t the only name of the game. This is part of the dreaded platform that trips up many non-fiction writers, but it IS an important part of the overall package you present to publishers. If you’re a good enough writer/blogger, publishers will find you. Myth: Again, the chances of this happening are pretty small. Remember that 290,000 number up there? And the 1,000,000 in “non-traditional” publishing? There’s a ton of writing out there, it’s highly unusual for a publisher to go courting it (unless you’re a celebrity and then none of this applies). That doesn’t mean there aren’t exceptions to this rule, but they are DEFINITELY exceptions. Truth: If you are a good enough writer/blogger, you have the skill that publishers are looking for—writing, telling a good story (or sharing good information), and promotion. You just need to be prepared that it will take work on your part BEYOND just writing it and hoping they appear. Publishing a book is the best way to make money from my blog. Myth: Publishing for the mass majority of authors is NOT a way to make a big living. I know a lot of bloggers who are making more with their blogs than they would make publishing a book traditionally—and not just people like Dooce or ProBlogger (who are kind of bad examples for anything by the way. They’re outliers, not the norm). The financials of traditional book publishing don’t always work that great for the author—and even when they do, you are sharing your money with a LOT of other people. You’re not in control of the sales, you’re not in control of the bulk of the revenue, and you’re not the person getting the bulk of the money. Truth: Publishing a book can be *A* way to bring in money based on your blog. One kind of income stream, absolutely. And if you’re really good at marketing and promoting it, a good income stream. But it may very well not be the BEST way. I love books, I love writers, I love bloggers, and I love publishing. I love when those things all collide. But please, please understand that a lot of the “conventional wisdom” floating around on the web about publishing is not 100% accurate. And if you’re interested in book publishing, don’t forget to check out my other publishing posts! And I’m still taking questions for what YOU want to know about publishing. *As always, I will put the caveat that this is based on MY experience in the industry, my reading of the tea-leaves, and my knowledge of how the industry works. There are always outliers and exceptions. That’s why they are called outliers and exceptions. This is so helpful, and so smart. Great info here! There is so much misinformation being spread, particularly among bloggers, about book publishing. It must be infuriating for you. It gets frustrating for sure. Sometimes I just want to go around the internet correcting people–which I’m sure would go over like a lead balloon. Glad my wife is the exception then! Had a blog, and publishers approached her. Now they want book #2. That’s fantastic! And proof that, yes, there are opportunities out there (and more proof that if you do good work for your publisher, they’ll want you back!). But yes, I would call her the exception, not the rule! So what you are saying is that publishers want a good story, well told, that satisfies a niche in the market? Actually, this is an incredibly helpful, straightforward, honest reality check for a lot of folks, including me. Thank you. It’s nice (and rare) to hear someone talking about this who actually, like, knows what she’s talking about. Hallelujah. I’m so glad you put this out there. I know so many people who are convinced that a publisher is going to come looking for them. Great post. I signed with a literary agent this fall and she didn’t think she would have any problem selling my humor memoir. But guess what? Publishers aren’t as hopped up about mommy bloggers as they once were. We are hearing they love my voice and my story, but that it just won’t sell in this market right now. Problem is I have to market myself as a mommy blogger because that’s my platform, but without my platform, I can’t sell a book. Ridiculously frustrating. Memoir is notoriously hard. Blogger or no, unless you’re a celebrity, memoir is maybe the HARDEST to publish…because it’s the hardest to market and the hardest to sell. Sadly, because great memoirs are some of the best writing out there. It is a catch 22–you need a platform, but the platform has to be right “for the moment.” I wish my industry made it easier, I really do. I will say that self-publishing electronically does NOT carry the same stigma within the industry as it did even 5 years ago. And as ebook usage goes up, I think the stigma will lessen every year. So if you did go that route, you’re not cutting yourself off from publishing traditionally in the future, particularly if you do well. My name is Ashley and I stumbled across your blog on ourlittleapartment’s post on jobs. I work in publishing too! And yes. It seems as though many bloggers get frustrated when they have decent numbers and publishers aren’t knocking down their doors. I can’t even tell you how many books my company publishes each year, and most of our work is done in-house (we RARELY use outside authors). And unfortunately, even after your book is published, there’s no certainty that it will actually SELL. Writing about publishing was something that I hesitated about doing for a while (as a personal blogger, I’m not speaking on behalf of my company, and I’m trying to make sure I keep myself “clean” as far as my job goes, you know? ), but I finally saw so much misinformation and misconceptions that I decided it would be better to share what info I have than just sit and bite my tongue anymore! After a year of trying to find an agent I decided to self-publish, something I never would have considered a few years ago. My book, Diary of a Public Radio Slave, is now available as an e-book on Amazon, and I’ve just started the marketing process this week–it is daunting. I look forward to seeing your posts on self-publishing. Self-publishing is experiencing a BIG change these days, and I tell people all the time that it may be the better option for a lot of people. But yes, the marketing is a BIG part of that process–a self-published author has to be all things!–and it’s not always easy. I’m hoping to get the self-publishing posts up in a couple of weeks, so hopefully you’ll come back and check it out! Thank you for this info! I’ve wondered about this. Even with this info., I am still going to try. I just found this via She Suggests. Thanks for putting it out there. Some of us have no idea how to even begin; hashing the reality from the myths. 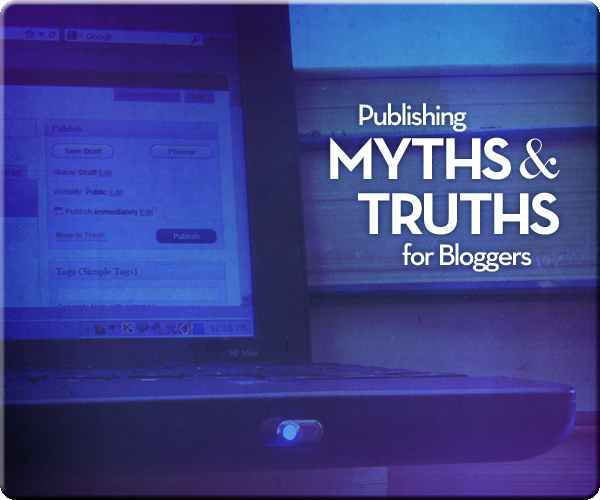 Wow, who knew there were so many myths out there in regards to blogging and publishing! Of course, this direction never occurred to me. I can’t say that being published never crossed my mind, but I never thought it would be easy and without working for it yourself. These are some great tips that could help lots of people who are thinking about being published. Thanks for clarifying a lot of publishing myths! stumbled! I’m a big lover of the bargain section at Barnes & Noble and then I remember once reading about observing that section with the eyes of a potential author: those books, that were published, didn’t really “make it”. Ever since then, my eyes were opened to the ENORMITY of the competition in book publishing. And that was LONG before I became a blogger. Also, as an avid reader I pray that nothing EVER happens to the publishing industry! Thank you, thank you, thank you! You have confirmed my suspicions. I get so tired of people telling me that I need to write a book about homemaking or sewing (my other blog). I just smile and tell them that the blogs, teaching, and being a homemaker keep me busy enough, thank you very much. The truth is, I *have* written a book–it was my dissertation and about 10 people read it. And I was a co-author (along with 15 other people) of an educational technology textbook that was practically obsolete by the time it was published and based on my two small royalty checks, my dissertation may have had more readers. Writing a book is hard work! A blog is a piece of cake in comparison. I’m so glad to see someone honestly saying all the things that I have long suspected to be true of the publishing industry. Such good information that you’re providing here. Love it and thank you for sharing them. I am working with a young girl (13) who wants to self-publish her book about her bone marrow transplant. Is self publishing an easy process? I Don’t know a lot about it, and google has SOOO much information it’s hard to sort it out. Just curious if you have any input!